Esta fue una parada en boxes durante nuestro viaje a Puerto Cañaveral. En general, fue buena. Hay un montón de tiendas y restaurantes! Las tarifas por aquí es bastante decente. Tienen una fábrica de queso aquí! Jacksonville se nombra en honor del presidente Andrew Jackson, y platted un año después de que Jackson se convirtió en presidente. Es la ciudad más grande de la Florida por la población y la geografía, con una población de poco menos de un millón de personas. Jacksonville tiene la distinción de ser una de las ciudades más grandes de los Estados Unidos por la superficie terrestre. Más allá de eso, no hay mucho más que los distinguen de la ciudad en términos de lugares para ver y cosas que hacer. Jacksonville es una ciudad portuaria y en la junta con Georgia. También es el final o el principio de la Interestatal 10. También tiene un gran observación de aves y parques del estado de Florida para todos los tipos de actividades recreativas. Metro / ciudad que todavía tiene una sensación de pueblo pequeño. Acceso rápido y fácil a los lugares históricos y playas. La ciudad también tiene vida nocturna para adaptarse a la mayoría de los estilos: País - Rock - Blues / Jazz - Ligera - vivir bandas - Los conciertos. Fue a Jacksonville para el trabajo. Sin duda parada por el aterrizaje de Jacksonville, en el centro. Gran lugar para fotos y un montón de restaurantes. Además, si usted es un bebedor de cerveza, asegúrese de pasar por la cervecería Anheuser-Busch y obtener sus papilas gustativas Budweiser listos para una degustación de cerveza! Esta ciudad a orillas del río San Juan es su entrada al estado de la Florida por nosotros Interestatal 95. Atlantic Beach es un gran, joya escondida! Si usted está buscando un gran partido y cabeza de acción sin parar hasta Jackson Beach. Picture broad, sandy beaches; wetlands surrendering to woodlands; skylines of skyscrapers, bridges, and ocean freighters; canopies of palms, magnolias, pines, and water oaks dripping with Spanish moss; dolphin and manatee sightings, along with the occasional alligator or shark; patient fishermen stalked by opportunistic pelicans; and, well, the typical mix of neighborhoods, cultural offerings, sports teams, office parks, highways, urban concerns, restaurants, and chain retailers one comes to expect in any major American city. Welcome to Jacksonville. Welcome to the Coastal South. Too laid-back for Miami but too busy for Charleston, Jacksonville is situated about halfway between, along the westernmost stretch of America’s East Coast. Sure, there are cities with more energetic urban centers, beaches with more tropical shades of water, and nature areas offering more adventurous hiking trails, but few cities can deliver the all-in-one experience that Jacksonville can. Water and nature-based pursuits are big draws in the Jacksonville area, in addition to the city’s more cosmopolitan characteristics. The beaches that line barrier islands across the Intracoastal Waterway, for example, feature some of the state’s best surfing spots, widest sands, and highest dunes. Many information sources will tell you that Jacksonville is the largest city in land area in the contiguous 48 states, but they likely won’t tell you that giant swaths of its square miles consist of vast marshlands, forests, and a network of waterways branching from the north-flowing St. Johns River. Jacksonville is a big city, but nature is a big part of it. Once upon a time, Jacksonville, which has the largest city-proper population in the Southeast, was relatively unknown compared to similar-sized places. Thanks to the Jaguars football team and the 2005 Super Bowl, Jacksonville has been able to raise its profile considerably over the past 20 years, but the city still seems to be OK with keeping its charms on the down-low while its other Florida sisters battle for tourist dollars. While Jacksonville doesn’t get as much tourist attention as it should, it has long been one of the country’s fastest growing cities, so people are taking notice. Like in any major city, it should be no surprise that Jacksonville has its rough, down-trodden, and dangerous areas to avoid, but generally speaking, the eastern half of the city is its better side (and the side with the most to offer visitors and residents alike). That said, no matter where one goes in Jacksonville, it’s tough to beat the beaches. Across the Intracoastal Waterway, Atlantic Beach and its smaller neighbor, Neptune Beach, share a popular, casual “town center” with local fave restaurants, boutiques, and mom-and-pop shops. Boasting quirky oceanfront architecture, bike-friendly streets, and a well-established surf culture, Atlantic Beach is Jacksonville’s best all-around beach town. A little farther south, Jacksonville Beach is the largest and most commercialized stretch of the barrier island. The area’s primary beach destination in terms of hotels, popular restaurants, and annual festivals, Jacksonville Beach has its own skyline of high-rise and mid-rise condos, an ocean pier, and the Adventure Landing amusement/water park complex. Like Atlantic and Neptune Beaches, the northern and southern stretches of Jacksonville Beach are great places to spend the day playing, relaxing, or taking a scenic stroll. Just be aware that the blocks closest to either side of Beach Blvd., in the heart of “Jax Beach,” tend to attract a rowdier, sketchier crowd on weekends. Immediately south of Jacksonville Beach yet technically across the St. Johns County line, Ponte Vedra Beach is the area’s swankiest community. Home to professional golf’s Tournament Players Championship and a trio of highly-acclaimed resorts, Ponte Vedra Beach not only offers ample opportunities for country club living but also boasts many of the priciest oceanfront mansions in Northeast Florida. That said, Ponte Vedra Beach has a certain exclusivity--and history of hiding state-mandated public beach accesses to prevent the great unwashed like me from visiting. Nevertheless, it's worth driving through the community to reach Mickler’s Landing Beach, a popular pubic beach park just south of Ponte Vedra that offers a large parking lot, oceanside views of gargantuan oceanfront palaces, and some of the best shark’s tooth hunting in the state. 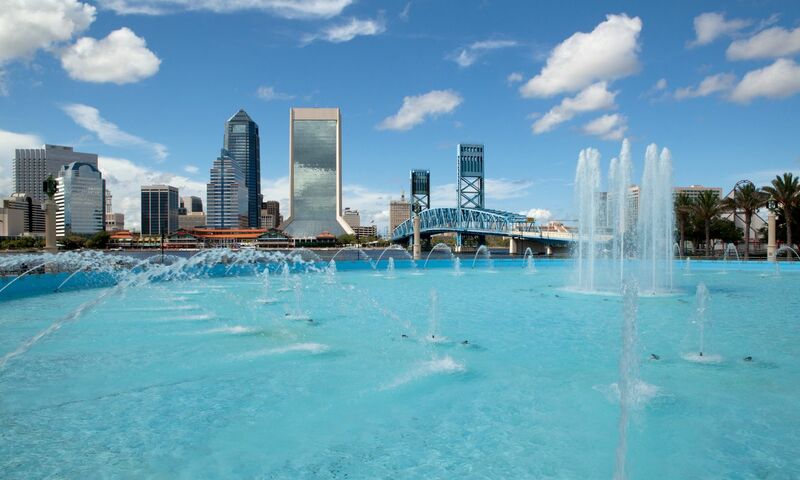 Downtown Jacksonville, in roughly the center of the city, offers two underappreciated riverwalks, a water taxi service, Friendship Fountain, a science & history museum, a modern art museum, sports and performance venues, and even tours of a factory that makes robots. Downtown’s big venues--TIAA Bank Stadium, the Veterans Memorial Arena, the Baseball Grounds, Daily’s Place Amphitheater, the Times-Union Performing Arts Center, and the Florida Theatre—each draw lots of locals and visitors for special sports events and live performances year-round, but the urban core still struggles to stay vibrant during after-work hours. Artists and entrepreneurs have been infusing new life, primarily with popular art walks, a restaurant boom, and an influx of loft apartment projects, but it has been a tough sell to lure suburban families away from the beach and other popular focal points to take advantage of downtown’s potential. Jacksonville Landing, a dying riverfront marketplace that continues to draw special events of local interest, is in jeopardy of being torn down and replaced. A few major redevelopment proposals should come to fruition over the next several years that will likely move downtown’s focal point closer to the sports complex. Bordering Downtown to the south on opposite sides of the St. Johns River are the popular historic neighborhoods of Riverside-Avondale and San Marco. These always trendy areas generate a lot of buzz with foodies, artsy types, and people cooler or trendier than I am. The Riverside Arts Market, held on Saturdays under the Fuller Warren Bridge (I-95) at the southern terminus of the Northbank Riverwalk, is a very successful weekly event that brings out some of the city’s most creative artists and musicians offering interesting alternatives to traditional mall merch. Within easy walking distance, the Cummer Museum & Gardens is touted as one of the finest art museums in the South. Pockets of bohemian quirkiness and/or stylish sophistication can also be found in these historic districts, especially in the blocks known as Five Points, San Marco Square, King Street, and the Shops of Avondale. Murray Hill Theater, located at the edge of Riverside-Avondale, is a legendary venue for Christian rock and rap concerts. The Beaches along the coast and the Riverside-Avondale/Downtown/San Marco neighborhoods in the center of town serve as bookends to the Jacksonville I have grown up knowing and watching develop. In between, The Southside (actually southeast of Downtown and west of Jacksonville Beach) is the busy heart of Jacksonville’s modern suburban scene, centered around a massive upscale retail and dining hub known as St. Johns Town Center (think Nordstrom, Tiffany & Company, Cheesecake Factory, P.F. Changs, and the like). The area around this complex, located where the office park corridor of Butler Blvd. meets the city’s eastern beltway (I-295), continues to explode with new retail developments, restaurants, and attractions like IKEA, iFly indoor skydiving, and TopGolf. A short drive north of St. Johns Town Center are the more scenic and sedate areas that line both sides of the St. Johns River as it extends eastward from the Downtown curve to the Atlantic Ocean jetties. These areas offer pretty waterfront vistas, nature parks with good trails, and interesting historic sites. The Timucuan Preserve, which straddles the St. Johns River and includes the historic sites of Fort Caroline (where French Huguenots first brought Protestant Christianity to America in 1564) and Kingsley Plantation (a well-preserved former sea island slave plantation), is the tourist focal point in this part of Jacksonville. Four nature-oriented beach parks also line Jacksonville’s Atlantic coastline between Atlantic Beach and the city’s county line boundary with Amelia Island to the north, with the driftwood forest and boardwalk trail of Big Talbot Island State Park being the highlight. The city also has a scenic arboretum and a very nice zoo to explore as well, both within easy reach of the I-295 East Beltway. Speaking of the beltway, the iconic Dames Point Bridge is a landmark worth both driving across and admiring from afar. It arcs high over the city’s main port facilities where huge cargo ships deliver goods to and from Jacksonville’s harbor. It can be fun to watch these ships make their way up and down the river, especially from the vantage point of the Mayport Boat Ramp. Mayport is a rustic corner of Jacksonville near the mouth of the St. Johns River and adjacent to one of the country’s biggest naval stations. It’s home to fresh-from-the-boat-out-back seafood shacks, hungry pelicans, a decommissioned lighthouse, and the St. Johns River ferry, which serves as a scenic segment of Florida’s famous coastal route, A1A.